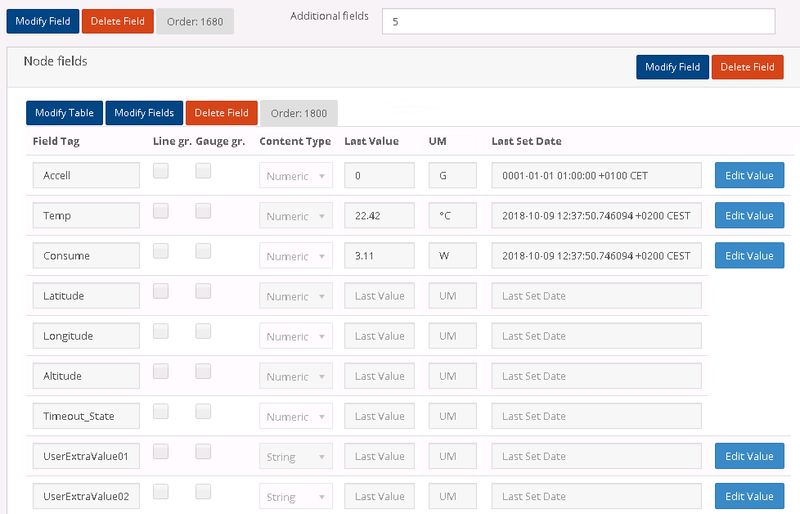 The node tag fields are contained in each node page. 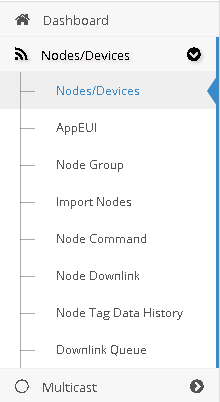 From the lateral bar click on Nodes/Devices and in the sub-menu click on Nodes/Devices. Click on the node you want then scroll down, up to about the middle of the page you can find the Node fields under the field called "Additional fiels". Field tag: it's the name of the field, it needs to be unique inside the node. Line gr. : this checkbox tells if this value should be represented using a line graph automatically shown in the dashboard. Gauge gr. : this checkbox tells if this value should be represented using a gauge graph automatically shown in the dashboard. Content type: it's the type of value recorded in this field, it can be string, numeric or boolean. Last value: this contains the last value received by the server. UM: it stands for Unit of Measurement, you can input any string you want. Last set date: this shows exactly when the last value was recorded. Edit value button: this button allows you to input manually any value you want in the Last value field.